Calais migrants try to board lorry Jump to media player Large numbers of migrants are attempting to get into cars and lorries, backed up at Calais, because of a strike by French ferry workers. Calais migrant: We live like animals Jump to media player Osman is one of a growing number of migrants living in Calais, northern France, who hope to enter the UK - he shows his makeshift living conditions. 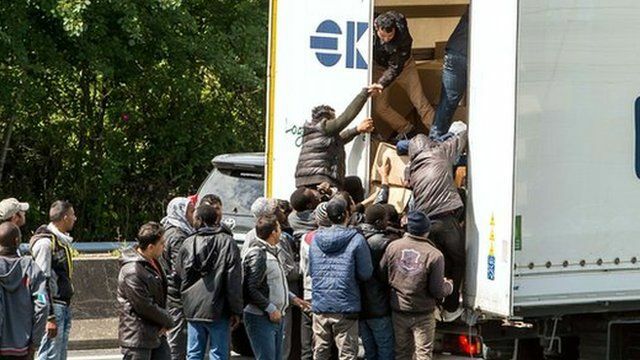 Calais 'dangerous' for lorry drivers Jump to media player Lorry drivers travelling through the French town of Calais say the situation is becoming increasingly dangerous as migrants try to stow away on their vehicles. The migrants who make it to Calais Jump to media player Paris Correspondent, Lucy Williamson has been to hear Mohammed's story, a 35 year old from Sudan. Dumping ground camp for Calais migrants Jump to media player The French government has designated an area for homeless migrants in Calais on what was an old dumping ground - and those living there have no power and no accommodation. Calais 'battles' with migrant influx Jump to media player Officials in Calais say they are struggling to cope with a huge influx of migrants trying to get to Britain. Police and migrants clash in Calais Jump to media player A rumour of police brutality in Calais, northern France, spirals into a large-scale confrontation between migrants and police. A strike has forced the suspension of services through the Channel Tunnel between the UK and France, as hundreds of migrants try to board UK-bound lorries amid the chaos. About 3,000 migrants are estimated to be living rough around Calais, waiting for a chance to cross the channel.